There has been increased publicity recently over the potential to grow food on ‘under-used land’, such as urban green spaces and derelict land. The information below has, therefore, been produced to explain the potential health risks of growing edible crops on such areas of land where the condition of the soil may not be known. 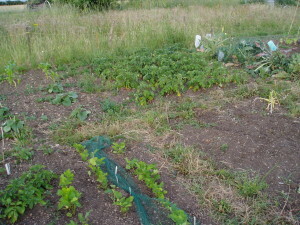 The aim of the information is to draw gardeners’ attention to the possibility that the soil may contain elevated levels of contaminants that could pose a risk to human health, both through contact with the soil and through eating food grown in the soil, and to provide information on what can be done to reduce these risks. Land that is contaminated contains substances in or under the land that are actually, or potentially, hazardous to health or the environment. The UK has a long history of industrial land use and throughout the country there are numerous sites where land has become contaminated by human activities such as mining, railways, industry, chemical and oil spills and waste disposal. Contamination can also occur naturally as a result of the geology of the area, or even through agricultural use. However, it is important to note that the presence of contamination in the ground does not necessarily mean that there is a problem. In many cases there will be minimal risk from living or working on contaminated ground. Indeed, many contaminated sites are successfully and safely redeveloped to provide high quality housing and working environments. Human exposure to contaminants can be through inhaling dust or gases, contact with soil, or through eating food grown on the land – plants can absorb the contaminants from the soil and the air. In some cases sites are so contaminated that they present an unacceptable risk to human health or the environment. However, the effects will depend on the type and amount of contaminant involved. The impact on a person’s health will also depend on how they are exposed to the contaminant and for how long. Children tend to be more vulnerable to exposure. Eating crops grown on contaminated land may increase the health risks as contaminants may be taken up from the soil by the plants. Legislation in the UK falls into two parts. Firstly, Part 2A of the Environmental Protection Act 1990 was introduced in England and Scotland in 2000 (2001 in Wales), placing duties on local authorities to identify sites that may potentially be contaminated in their area and ensure that they are assessed and, if necessary, cleaned up appropriately. This process is aimed at dealing with only the most contaminated of land. As a result, it is complex and time consuming and, therefore, not all potentially contaminated sites have yet been identified or managed. Similar legislation for Northern Ireland has not yet been implemented. Secondly, when there is a change of land use and a site is redeveloped, the planning process should ensure that the risk of contaminated land is assessed and land is made suitable for its intended use by developers. This is the most common form of dealing with any contamination that may be present. Under planning, land contamination falls under what is known as a material planning consideration. As a result, if present, it must be made safe for its intended use. The intended use of the site is important because it determines what contact users will have with the soil. So, for example, land that has been assessed and deemed safe for use as a car park, offices or factory may not necessarily be recommended for growing edible crops; regular human contact with the soil or eating crops grown in it would not have been considered at the planning stage. If you are planning to grow food on any plot of land that has not been approved for edible crops, particularly if it was formerly used for industrial processes (or is in use as such) a cautious approach should be taken. Measures should be taken to understand the contamination potential of any activities taking place, or that have taken place on the land, and to reduce human contact with and consumption of soil. As outlined above, policy exists to ensure that risks are assessed when there is any formal change in use to any land. By bypassing the planning system, users are in effect bypassing the processes that are in place to protect their health and that of their children. How Do I Find Out if a Site is Contaminated? The starting point is to find out more about the history of the site. A plot of land that is on, or adjacent to, current or former industrial processes can be considered as having an increased possibility of being contaminated. Land that is more likely to be contaminated includes railway land, graveyards and burial sites, dry cleaning premises, waste disposal operations, abattoirs, manufacturing premises, amongst others. Historic ordinance survey maps from local libraries can help identify the former use of land. Local authorities maintain records of known or suspected contaminated sites and should be consulted on any plans to use land within their vicinity for growing foodstuffs. The site may have been identified as potentially contaminated by the local authority, or it may have been investigated to an extent where they can advise whether it is suitable for growing. Where there is reason to suspect potential contamination, they must exercise due caution in order to protect human health and the council’s liability. They may not be able to disclose information on ongoing investigations. Private landowners may have useful information and may be supportive of plans to use land safely. It should be noted that entering land without the permission of the owner may constitute trespassing. Furthermore, landowners could potentially be liable for damage suffered by those who use their land for growing and eating produce, even if they are not aware that it is occurring. Consultants can be employed to investigate the site by taking samples of the soil and analysing them to assess the suitability of the site for growing edible crops. Cleaning up of the soil may be required. However, there may be significant costs and time periods involved, which can increase depending on the size of the site. How Can I Avoid Contamination? Where a site is potentially contaminated, users are advised to choose an alternative space to grow crops. If in any doubt, measures should be taken to reduce exposure: exposure can be through dermal (skin) contact with contaminants in soil, by inhaling dust or gases at the site, by eating the soil, or by eating produce that has taken up contaminants from the soil. Reducing this exposure will reduce the risk. Gloves should be worn at all times. Even so, ensure hands are washed thoroughly with warm soapy water after gardening, carrying soil/dirt, etc. Children should be encouraged to wash their hands frequently and to avoid excessive contact and eating soil. Children tend to have more contact with the soil and are more vulnerable to exposure. Thorough washing of produce should reduce the actual amount of contaminant taken into the body. Peeling produce, especially root vegetables, is recommended good practice. If in doubt, use grow bags or containers and fill them with clean soil – make sure you place them away from sources of airborne pollution such as bus stops and busy roads. Vary the source of your fruit and vegetables. Eating the occasional produce that contains elevated levels of contaminants is less likely to have a toxic effect than daily consumption. However it should be noted that some contaminants may cause cancer and so this does not apply universally. Your local authority, who may be able to advise if a site is suspected of being contaminated or they may have already carried out tests at the site. More specific site related advice may be given, such as if a site would be suitable for growing foodstuffs. The Food Standards Agency may be able to provide advice on the types of plants that should be avoided on a particular site. For advice on health risks from dermal contact and inhalation of contaminants, contact the Public Health England, Public Health Wales, Health Protection Scotland, or the Public Health Agency for Northern Ireland.